This review of a New York eatery is a break from The Picky Glutton’s usual London-based coverage. The vast majority of the eateries reviewed on this blog are proper restaurants with full-service tables. Num Pang is a rare exception to this informal rule since it’s the only place I’ve ever heard of, either in New York or in London, to serve Cambodian sandwiches. The Midtown East branch, the newest sibling to the Union Square original and located only a short distance away from Grand Cental station, is little more than a counter and a handful of standing room-only tables. My London-based dining companions will know of my fondness for having two sandwiches, not just one, for lunch and I saw no reason to break this hearty tradition at Num Pang. 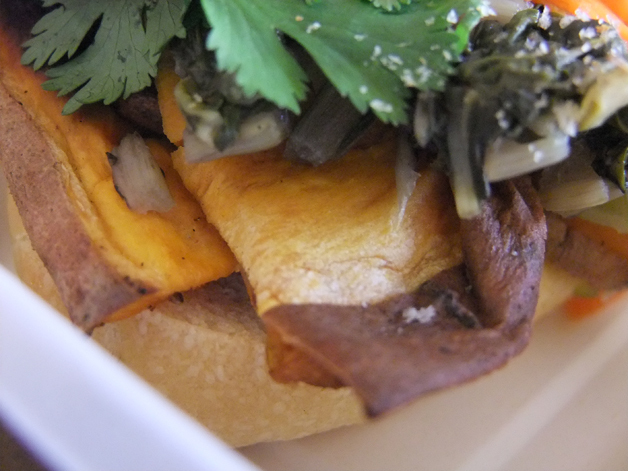 My first sandwich was filled with Japanese yams. I’m not sure what’s so Japanese about these yams, but the creamy, buttery tasting slices of vegetable were nevertheless nicely roasted and complimented well by the tanginess of the garlic mayonnaise and the tartness of the pickled carrots and cucumber. There’s plenty of fresh coriander and onions too. My second sandwich was filled with grilled catfish. I’ve never had catfish before, but I nonethless enjoyed the mackerel-like texture and the moreish, slightly tangy soy sauce-like flavour although it was obscured a little by the garlic mayo and pickled carrots and cucumber. While the toasted semolina-flour mini-baguette used with the Japanese yam sandwich was a little too tough or chewy in places, the same type of mini-baguette used in the catfish sandwich was consistently soft and yielding with a slight sweetness to it. 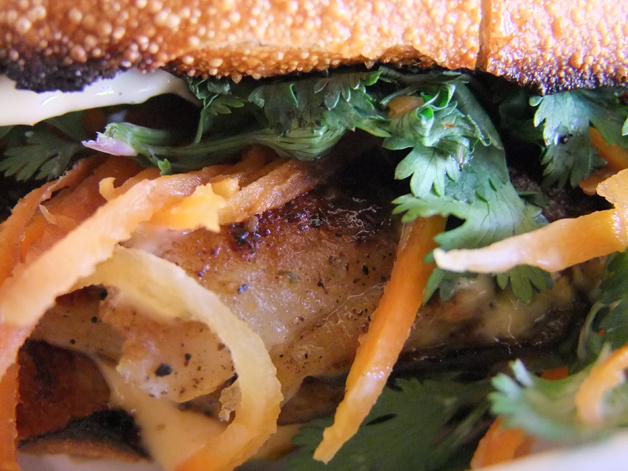 No cats were harmed in the making of this catfish sandwich. 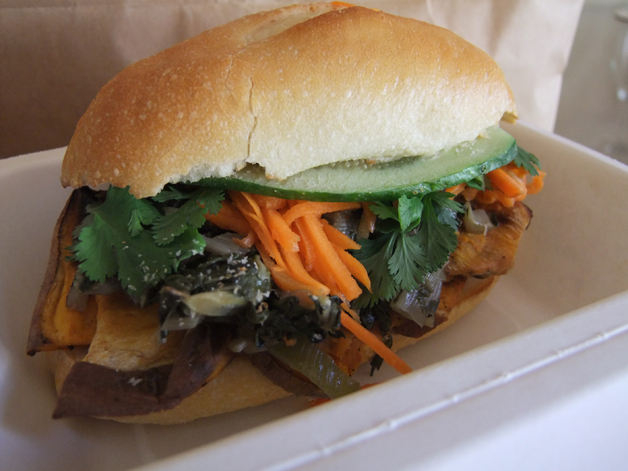 I’m not sure what’s so Cambodian about Num Pang’s sandwiches, but there’s no denying that they’re very different from your average run-of-the-mill baguette with interesting, tasty fillings. While the execution of the grilled semolina mini-baguettes is a little inconsistent, when done right, the taste and texture make going back to more widely available types of bread very difficult. Nam Pang is great for a quick lunch stop with its superior sandwiches that give Vietnamese banh mi a serious run for their money. Sadly, while banh mi eateries have been popping up around London for a few years now, I suspect it’ll be a while, if ever, before I see anything resembling Nam Pang in Britain and that’s a shame. 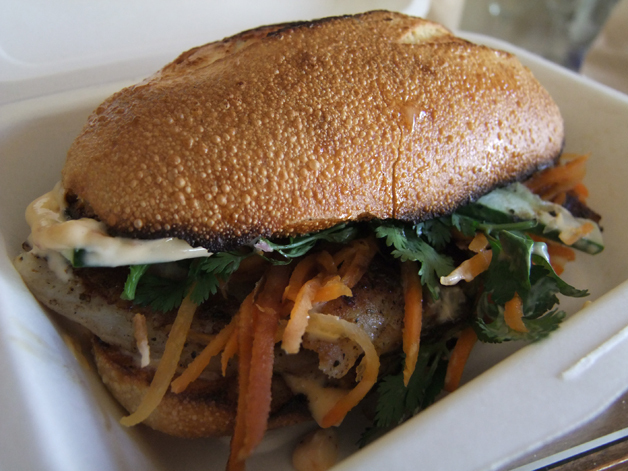 Tags: catfish, new york, num pang, restaurant, review, sandwich, yam. Bookmark the permalink.